In 2006 the word Google was officially included in the Oxford English Dictionary as a verb. ‘Google it’, is perhaps the only answer given these days when you ask someone for a little information on just about anything. We use Google for everything, from gathering information on something like the Galapagos Islands for a school project, to searching for funny videos of cats falling off couches. If there is one thing that Google has done its make our lives easier. If you want to see what movies are currently showing at your local theatre, you google it. If you want to know when it’s full moon, again you google it. All of the information in the world is right at our fingertips. But most of us don’t know how to access or use this information. So we have compiled a list of Google tools that will help make your travels easier. If for instance you often get lost in foreign cities, or you can’t understand the street signs in Japan, because they are all in Japanese, then these Google tools will certainly come in handy. The stress and hassle of finding and reading a conventional map has been eradicated by the revolutionary Google Maps tool. This program allows you to search for landmarks and directions in just about every city, town or village in the world. What it also does is allow you to explore and interact with cities, towns and villages in a way that has never been possible before. 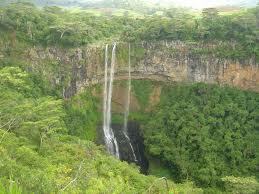 Street view is the best and easiest way of exploring the next city that you are planning to visit. Forget about looking at pictures or brochures. Get on Google Maps, search for your desired destination, drop yourself into street view with the little yellow man in the bottom right corner and start ‘walking’. Let’s say you book a room at the Intercontinental Hotel in Rome, which is at the top of the Spanish Steps, and you want to know how to get to the historical attractions in the ancient city from there. You simply hop onto Google Maps, drop yourself into street view and familiarise yourself with the route to the Trevi Fountain, Colosseum and the Pantheon. This will save you a lot of time, which can then be spent discovering more interesting sites. I couldn’t pass up the opportunity to share the Google Street view images of the Pantheon and the Trevi Fountain, it’s like you’re right there! 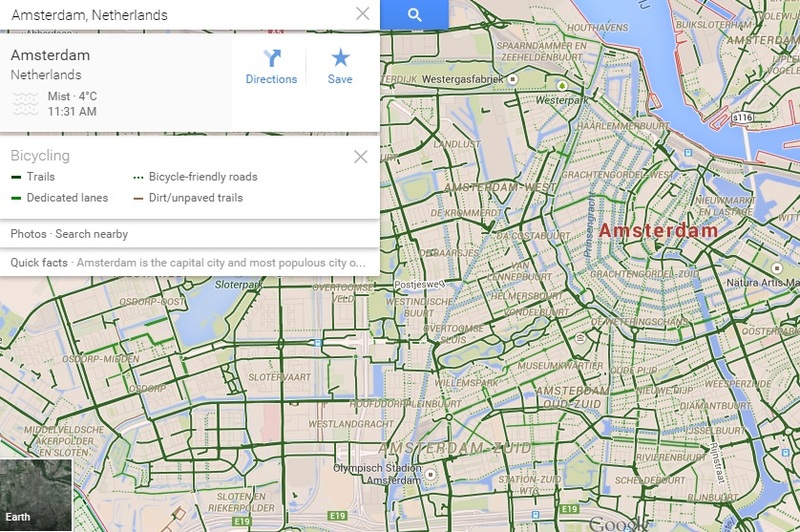 If you are travelling across Europe then this is perhaps the most useful tool on Google maps. If you click on the Transit link in the top right corner of the screen, then Google maps will show you all of the metro stations in the area that you are focused on. All of the routes will also be displayed and colour coded. This will help you identify where the closest metro station is in relation to your hotel, and it will show you which line to take to get to your preferred destination. The Bicycle routes tool is particularly helpful in cities like Paris, London and Amsterdam, where finding a bike to hire is quite easy. The tool will tell you whether the routes are dirt or unpaved trails, dedicated bicycle lanes or bicycle friendly roads. The green trails below show the dedicated bicycle lanes in Amsterdam. If you click on the traffic link on the maps toolbar, Google will show you what the traffic is like in the location that you are viewing in real time. You can also use the ‘typical traffic’ tool to see what the traffic is typically like at any time of the week. 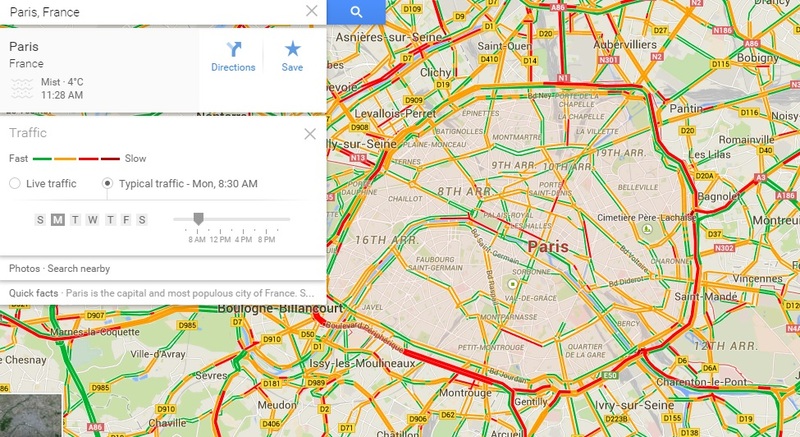 For instance, if you are planning to drive from the centre of Paris to the airport at 09h45 on a Tuesday morning, then you can use the ‘typical traffic’ tool to see which roads to take and, which to avoid. So let’s say you find yourself in the Hotel de Paris in Monte Carlo. It’s the weekend of the Monaco Grand Prix and you need to get from your hotel to the starting line of the race course, before the race starts. You need to know what the fastest route and mode of transport is right away. All you need to do is type in your start and end destinations, and Google Maps will show you the fastest route, distance, average travel time and recommend the best mode of transport. If you look at the map below you will see that if you walk to the starting line it will take you 3 minutes to walk the 290 meters. If you decide to drive it will take you 2 minutes to cover the 800 meters from the hotel to the starting line. Now you have all of the information you need to plan your 2-3 minute transit from the hotel to the starting line. You can do this for any route in the world. If you are thinking of driving from Kimberley to Nairobi, then Google Maps will tell you which route is the fastest, how far it is and how long on average it will take to get there. What more do you need from a map? If you find yourself in a remote foreign city or town for a couple of days, be it for business or pleasure, you will probably have to find a local restaurant for a meal or two. Let’s say you are in Prieska for the first time, and you are looking for a restaurant for dinner. If you search ‘restaurants in Prieska’ on Google Maps, then the program will show you where the restaurants are. You can then click on directions, type in your current location, and the program will show you the fastest route to the restaurant. 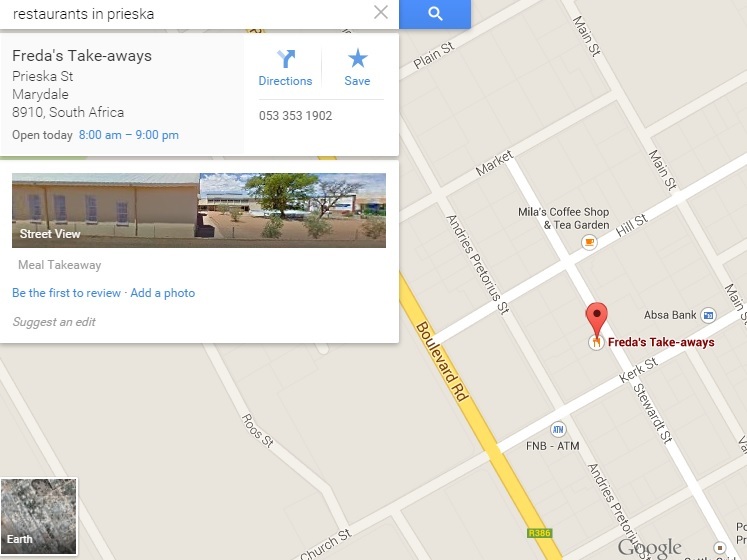 As you can see below Freda’s Take-away is in the centre of Prieska, one block away from a Absa and FNB ATM. If the program can show you where to get a take-away in Prieska, then it should be able to show you where to get dinner in just about every corner of the world. Wondering if you need to apply for a visa for your next trip? Just ask Google and it will tell you! We had to check if we needed a visa for our planned trip to New Zealand to go and play golf at the Cape Kidnappers Golf Course. After typing in ‘do South Africans need a visa for New Zealand’, Google told us that we don’t need a visa if we intend to stay in the country for less than 3 months. Simple as that. This is perhaps the most essential tool for all travellers these days. If you are travelling to Vietnam to go and explore Ha Long Bay, then the currency converter will tell you how much Vietnamese Dong you will be getting for your Rand. The converter uses real time data to calculate the conversion. This means that you will be getting accurate and up to date conversions, even with the Rand being so volatile in recent months. If you are flying to the other side of the world then the time difference will be a shock to your system at first. Google can tell you what the time difference is between your start and end destinations. If, for instance, you are travelling from Cape Town to Pyongyang in North Korea, then you will have to turn your watch back 7 hours. Just see how simple it is on the search we did below. Gone are the days where you struggle to understand the manager at the front desk of the Greek hotel you are trying to check into. Google translate will help you cross the language barrier with ease. The tool will also stop you from embarrassing yourself for incorrectly pronouncing the few lines of Greek that you learned before your sailing holiday. Almost every language in the world can be translated with this tool. We translated ‘Making Travel Easy’ to Kazakh below, there is no way that we are trying to pronounce that! This tool is great for when you are picking someone up from the airport, or when you are waiting for a connecting flight. You simply type the flight number into the search engine, hit enter and Google will tell you the status of the flight in real time. If you have to pick someone up at the airport, and you want to see if the plane will land on time, then this is the tool to use. 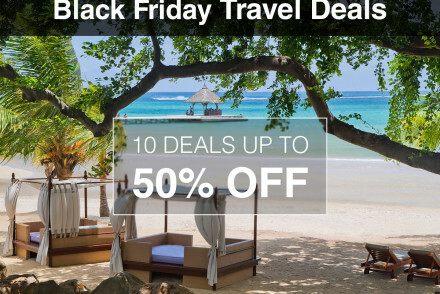 This is a quick and easy tool that you can use when planning your next trip. If you type in ‘flights from Johannesburg to Dubai’ on Google, the program will tell you how many scheduled flights there are, what the average flight duration is, what time the flights depart and what time they arrive. Google can give you a detailed weather forecast for any region in the world. 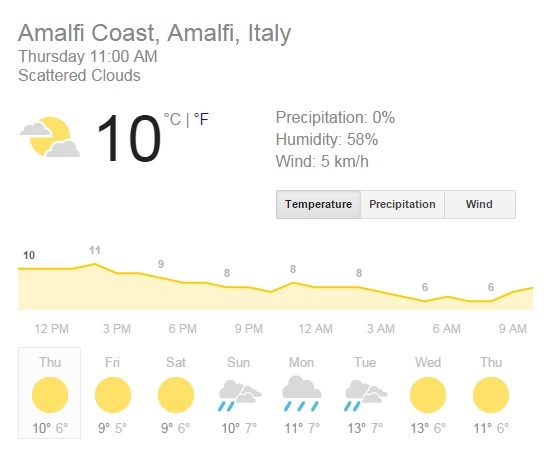 If you are planning a road trip though the Amalfi Coast in Italy, and you are wondering if you should get a convertible, simply check the weather forecast on Google, it might help you decide.